We’re two more weeks into our new build now and progress so far has been amazing with all the ground works pretty much completed. We can barely take our eyes off it because we can see changes every day. Week two saw the massive excavations extended and the foundations completely dug out for the visitors’ centre, giving us the chance to see its lay-out for the first time. 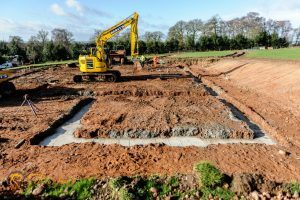 The indoor arena – where our old mounting up paddock used to be – was dug out, the area levelled and the stone sub-base for the arena floor laid and rolled. Week three brought another big step forward as the first of the concrete lorries came trundling down the drive. The holes that will take the steel frame of the arena were dug out and the holding down bolts were cast in readiness for the structural steelwork to be lifted into place. Now we can clearly see the floor plan and picture how big it will be when it is finished. I’ve been pacing it out on an imaginary horse! And the girls and I can already visualise ourselves riding in there. The visitors’ centre lay-out is now quite clear – you can probably all see it as you drive down to the car park – with the concrete foundations all finished. Now it’s all ready now for the brickwork to start and that will happen this week. That will be great to see because then it will really be taking shape and I think the rate of progress will speed up as the walls go up. The next big moment to look forward to is the arrival of the steel. It does feel as if we are living in the middle of a building site but it’s all going to be worth it in the end. From the trekking centre’s point of view, everything seems to be going great. Riding out from the field behind the car park hasn’t caused any problems and the horses are taking everything in their stride. Having heavy machinery rumbling round their home doesn’t worry them at all. 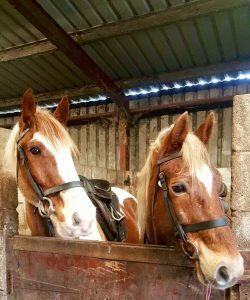 And although we’re a little short of room on the yard on busy days, they are more than happy to share stable space and double up with their pals. Starting the Build. Off to a Flying Start! It’s happening at last – our fabulous new trekking centre is underway and I can’t believe the progress we’ve made in just a few days. 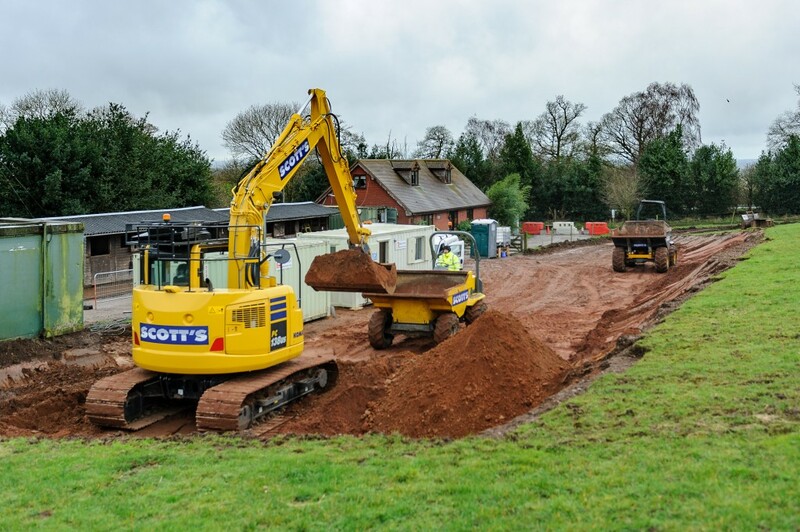 After all the planning and dreaming – and all the delays and red tape – the contractors have arrived and we have finally begun work on our long-awaited development project. It has been a long time coming and it seems quite surreal that we are actually breaking ground. Scary – but very exciting too! We have a hard working crew of contractors on site and the transformation every day is quite amazing. I really can’t take my eyes away from it. 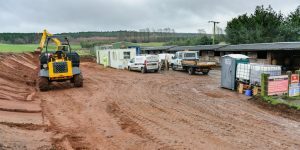 After just a couple of days the contractors’ compound was up, the area for the new stables dug out and the footprint of the visitors’ centre established. All you riders will see huge changes every time you visit. I had hoped that we would have started the work last summer, but a few little snags and hitches developed along the way that needed sorting out. But that’s all dealt with now and so finally the dream is taking shape. I began thinking about all this more than six years ago. It was then that I started considering that at some stage I would like to take the trekking centre into a new era. That dream became a necessity when I decided that our facilities were becoming tired. It was a case of scaling down the operation – or going all-out for a development that would enable us to offer our clients the very best. And we will also be providing top-class facilities for the staff and for our horses too. They work hard and deserve to be spoiled a little. 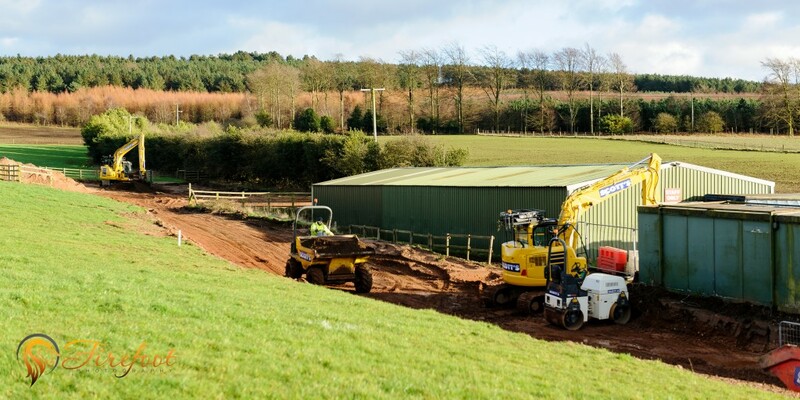 The new indoor arena will be the first to be finished and should be ready for use in April. The visitors’ centre, which will incorporate a cafe, shop, lecture area, showers and toilets, should hopefully be complete by late June or early July. The completion of both of those will enable us to offer our clients so many options with activities and I will keep you updated with all our ideas along the way. I think you will all enjoy the plans I am making! Of course, all this construction work will cause some disruption to our operations but we have devised a plan to keep us up and running without affecting our riders’ enjoyment. The office where you all check in for rides has moved onto the car park. So visitors will park there as normal, then check in as usual, but we will mount up and ride out from the rear field. We may, in fact, put a corral in there, but it might not prove necessary, so we will wait and see. Starting a major construction project in the winter may seem like odd timing, but it is ideal for us. This is our quiet time of the year when our rides are much smaller, so disruption will be kept to a minimum. When our busy period starts again, the build will be well advanced. And by the summer, all our new fun can start. Enjoy coffee and cake after a trek, join us for an evening barbeque ride, or get up early and come with us to spot wildlife on the Chase before a delicious breakfast! Then there will be workshops, lectures, Western riding, maybe even Pony Club games for adults! It’s all so exciting and I know all you are going to love our new-look centre. https://www.cannockchasehorsetrekking.com/wp-content/uploads/2016/02/TJH_0122-1024x681.jpg 681 1024 CCTC https://www.cannockchasehorsetrekking.com/wp-content/uploads/2017/11/cropped-icon.png CCTC2016-02-03 17:00:292017-11-23 12:25:15Starting the Build. Off to a Flying Start!